Video captured by Youth Against Settlements in Hebron on Oct. 17, 2015. A Palestinian activist group on Saturday released video footage it said may show Israeli soldiers planting a knife next to the body of an 18-year-old Palestinian shot dead by a settler in Hebron earlier in the day. 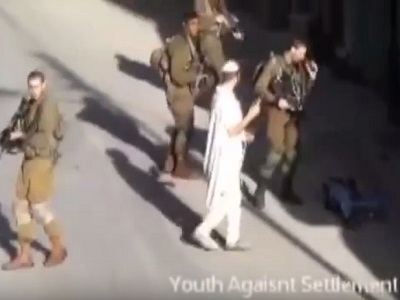 However, the footage — released by Youth Against Settlements — is not conclusive, and only appears to show an Israeli soldier handing an unidentified object to another soldier, who then bends forward, possibly throwing the object next to the Palestinian’s body. 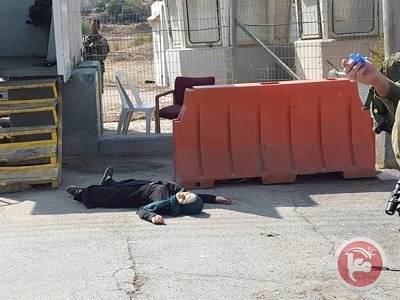 The Israeli army earlier told Ma’an that the Palestinian, identified as Fadil Qawasmi, had attempted to stab the Israeli settler, who then “opened live fire on the assailant,” killing him. 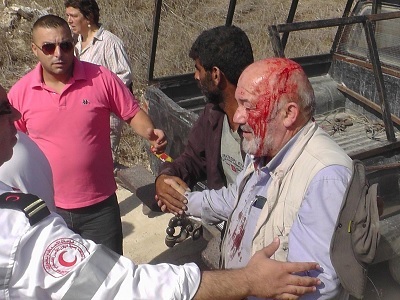 The settler was not injured during the incident. Sources told Ma’an that Israeli authorities had agreed to investigate the shooting following a request from the Palestinian liaison department. The liaison department reportedly made the request after they saw the footage. Israeli forces have meanwhile detained the media coordinator for Youth Against Settlements, Ahmad Amr, as well as a Palestinian who witnessed the shooting. On Wednesday, Israeli human rights organizations released a statement arguing that recent calls by Israeli politicians to shoot Palestinian attackers rather than arrest them effectively endorses the killing of Palestinians. The Video clip makes it clear of what took place!